Definition at line 37 of file util-hashlist.h. Definition at line 38 of file util-hashlist.h. Referenced by HashListTableAdd(), HashListTableFree(), HashListTableInit(), HashListTableLookup(), and HashListTableRemove(). Definition at line 41 of file util-hashlist.h. Referenced by DetectBufferTypeMaxId(), DetectPortIsValidRange(), HashListTableFree(), HashListTableGenericHash(), HashListTableInit(), HashListTablePrint(), PrefilterSetupRuleGroup(), RetrieveFPForSig(), SigGroupHeadFree(), and SigInit(). Definition at line 43 of file util-hashlist.h. Referenced by HashListTableInit(), HashListTableLookup(), and HashListTableRemove(). Definition at line 44 of file util-hashlist.h. Referenced by HashListTableFree(), HashListTableInit(), and HashListTableRemove(). Definition at line 42 of file util-hashlist.h. 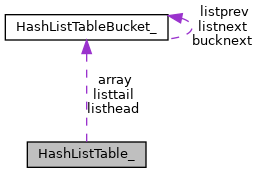 Referenced by HashListTableAdd(), HashListTableGetListHead(), HashListTableInit(), HashListTableLookup(), HashListTablePrint(), and HashListTableRemove(). Definition at line 39 of file util-hashlist.h. Referenced by HashListTableAdd(), HashListTableGetListHead(), HashListTableInit(), and HashListTableRemove(). Definition at line 40 of file util-hashlist.h.